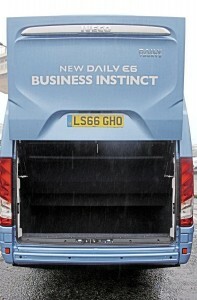 Rob Orchard casts a very experienced eye over the new factory-built Iveco New Daily minicoach contender. Can it match the independent converters’ offerings? 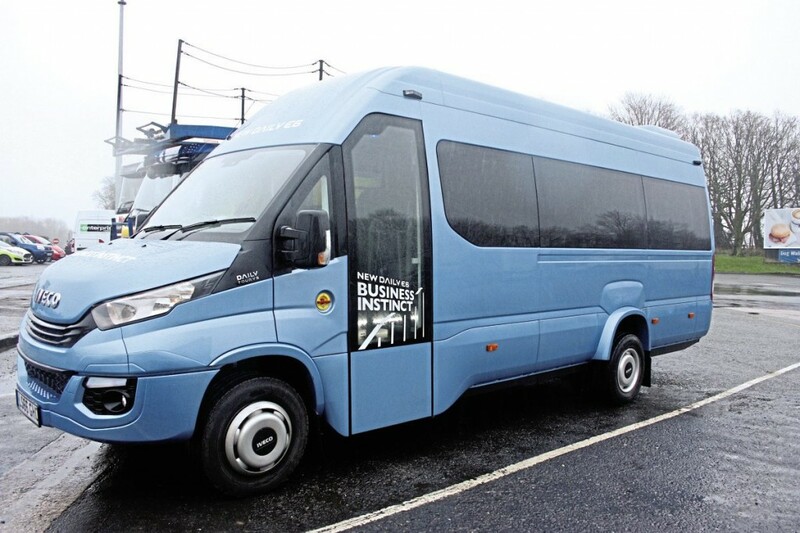 Iveco Bus UK has begun to import its own minicoach versions of the New Daily. 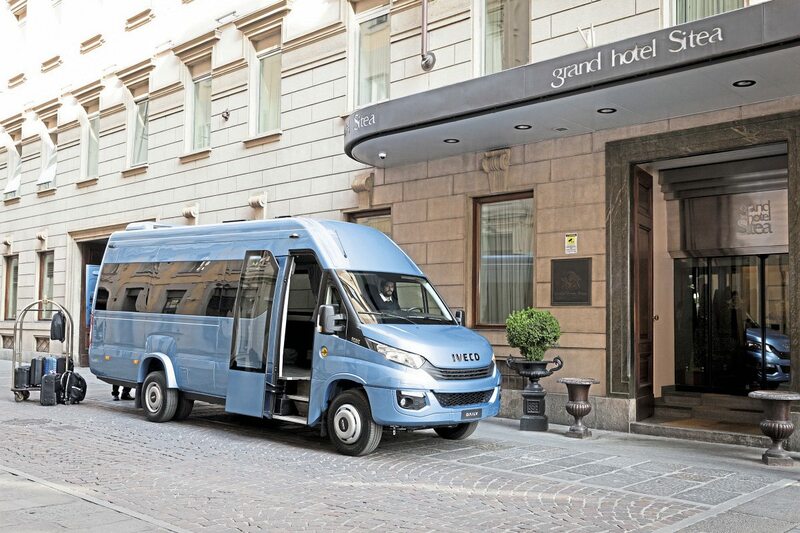 Called the Tourys they are entirely built within the Iveco Daily plant in Italy. 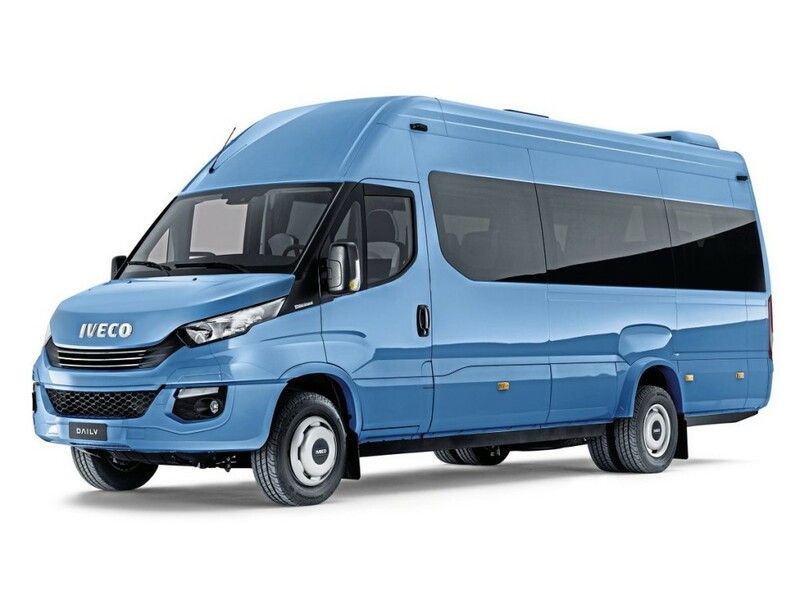 In the past, Iveco had the Tourys versions of the previous Daily built by an independent bodybuilding company, but the switch to adapting the Daily in-house will enable Iveco to increase production, it says. The bodybuilding company will continue to build special vehicles, as it has done in developing and building the prototypes of the New Daily Tourys. For example, it built the left-hand drive prototype that BCB drove at the New Daily launch some time ago. The first right-hand drive Tourys to arrive in the UK I have to say left me impressed. It is stylish, well-appointed and well built. 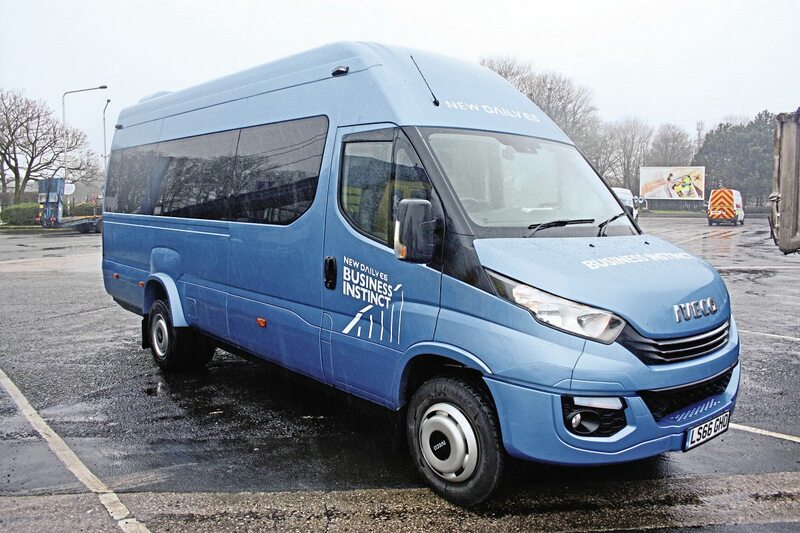 The Tourys being offered in the UK is the 4100L model which uses the 4100mm wheelbase Iveco New Daily. 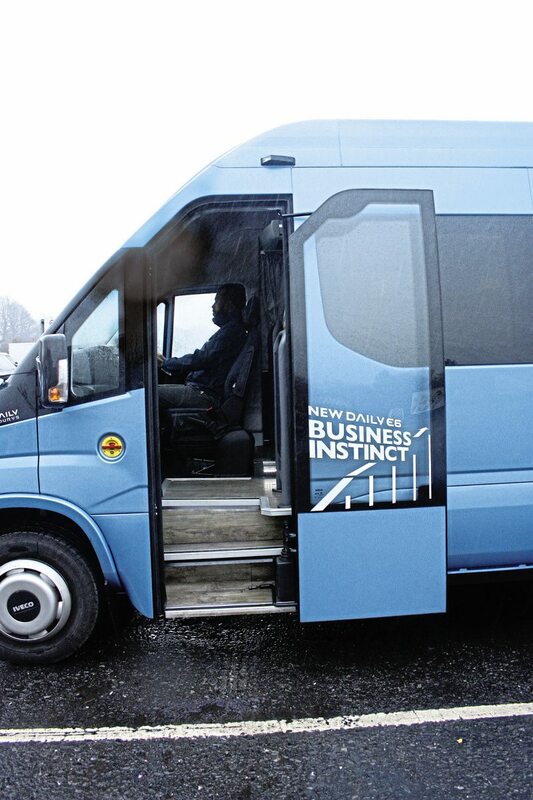 The vehicle has an overall length of 7.515m, can seat 19 passengers plus courier and has a 2.5m3 sunken boot. It is built on the 65C HD model which has a GVW of 6.5 tonnes. The engine is the well-respected FPT Industrial FIC 3.0 litre, four-cylinder, in-line, direct injection, common-rail, turbocharged diesel. The engine develops180bhp (132kW) at 3500rpm.The maximum torque figure is 430Nm respectively with the torque being available across a wide speed range 1250-3000rpm. The engine is turbocharged using a variable geometry unit. Emission control is to Euro 6 using a mix of EGR and SCR with Adblue. Standard transmission is the Iveco Hi-Matic eight-speed fully automatic unit, developed with ZF. Two settings are available; ECO, which short-shifts to keep fuel consumption low; or POWER which provides increased performance. Both settings are engaged using the gear control lever and you can automatically switch to either mode even when on the move. The Tourys can also be specified with the FPT 2840.6 six-speed overdrive manual transmission to special order. The front suspension is fully independent which utilises a system which combines Ferguson principles combined with torsion bar control. Front axle loading is 2.3 tonnes. Steering is variable ratio and powered. The turning circle kerb-to-kerb is 14.108m. Rear suspension is full air with electronic control and the vehicle has twin rear wheels. Loading is 5.0 tonnes. Braking uses discs all round but a Telma retarder can be specified as an option. Tyres are 225/75R16. A 100-litre fuel tank is provided plus a separate 25-litre Adblue tank. Safety systems include ESP, cruise control and Lane Departure Warning System. The overall dimensions are 7.515m long, 2.174m wide and 3.09m high. 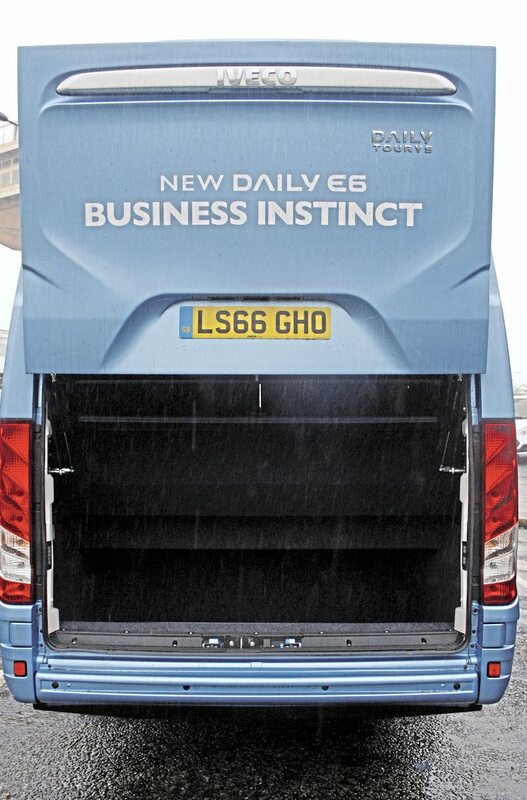 The side passenger entrance is fitted with an electrically-operated, glazed, plug door. There are three steps, with LED-lit edges, up to the saloon gangway floor which is flat with just a small further step up over the rear axle. The gangway is offset to the nearside. The seats are mounted on platforms using twin seats on the offside and singles on the nearside. 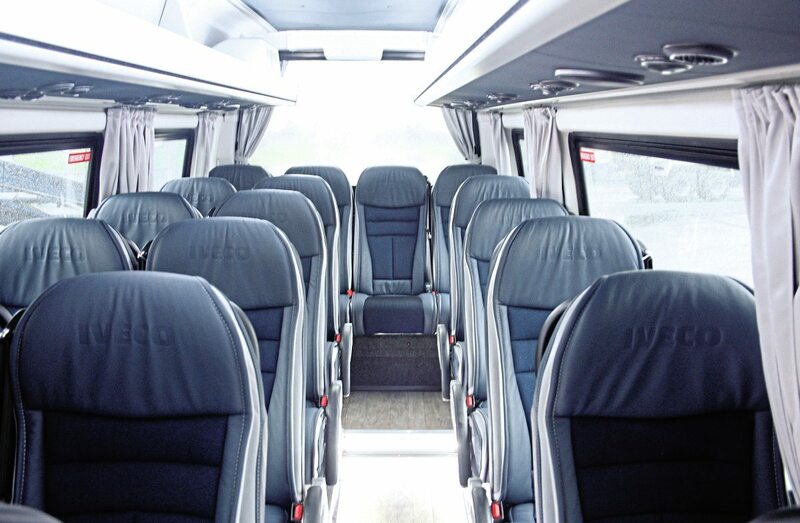 Reclining seats are trimmed in moquette and leather-effect fabric and are fitted with a grab handle and armrests. Three-point automatic seatbelts are standard. Glazing uses large panoramic, tinted, bonded windows. Double glazing is an option. Pleated curtains are a standard feature. The interior is trimmed out with ABS moulded panels and soft feel trims and the floor is covered in non-slip flooring material. There are full-length parcel racks down both sides of the saloon with the usual passenger controls, speaker and the main saloon lighting and air conditioning distribution. A glazed, opening roof hatch is fitted. The vehicle has a convection heating system and roof-mounted air conditioning unit. Air conditioning with a heating function can be specified as an option. 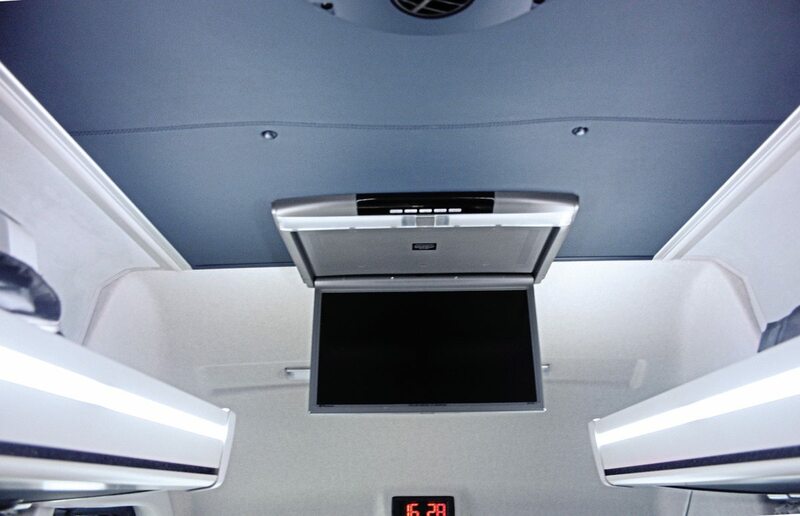 A drop-down 17-inch entertainment screen is fitted into the front roof bulkhead. A radio/CD/MP3 player is provided feeding through to the saloon speakers. USB points are provided at each seat. There is also a clock in the central front roof bulkhead. A one-piece rear door gives access to the luggage boot. The door has a lift-up, gas-powered, pantograph system. The driving cab is fitted with a fully-adjustable, air-suspended seat which is trimmed to match the saloon seats. The steering wheel and column are also fully adjustable. Many functions can be controlled from the steering wheel and other systems are controlled from the centre dash touch screen. The driver’s window is electrically operated and the external mirrors are both heated and electrically adjustable. There is a rear camera which feeds to the centre dash screen. There are fold down sun visors but not extending or electrically-operated visor. Other features are driver’s air conditioning, a refrigerated glove box, radio/CD/MP3 player, USB and Bluetooth connectivity. There is also a DVD and GPS. A PA system and microphone are not provided but are available as an option. Other standard features are LED daylight driving lights and fog lights. Body skirts and bumpers are colour co-ordinated and the standard paint finish is metallic. Overall it makes for a comprehensive package. As I mentioned earlier, I was impressed with the style of the Tourys and this was reinforced when I boarded the vehicle. I was impressed with the general standard of the internal fittings and trim. The standard of workmanship particularly in the area of trim fit and finish was high. 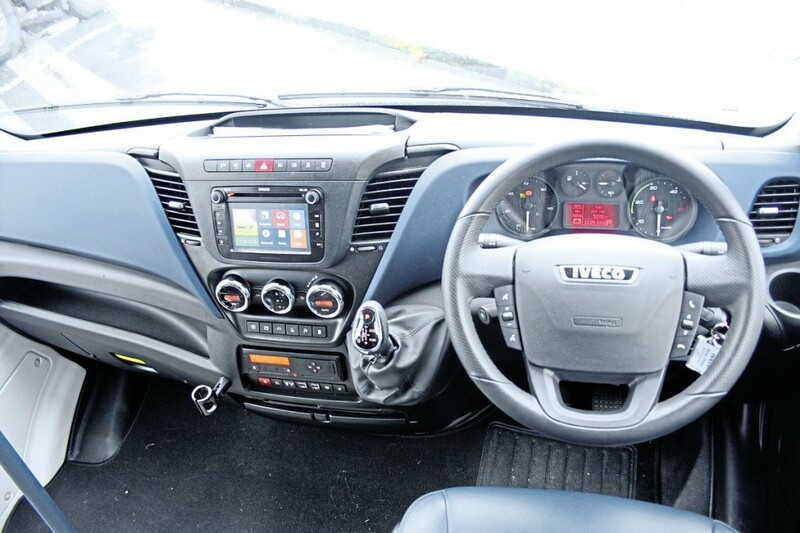 The New Daily has an excellent cab layout with well-positioned instruments and controls. I was glad to see the attention to providing the driver with good storage facilities for his equipment. I found the driver’s seat and the steering column easy to adjust to achieve a comfortable driving position. I like the New Daily cab I find the layout of controls and instruments to be excellent. I also like the whole style of the cab. It is comfortable, well-appointed and has a subtlety of trim which I find pleasing. I found the mirrors easy to adjust with the electric control and the availability of heating meant they could easily be kept clear of rain. It was an absolutely foul day weather-wise with lashing rain and a swirling wind. Plenty of spray and puddles but, living in Cumbria, I’m used to driving in those conditions. I have driven a lot of Iveco New Dailys, too, and generally found them be a pleasurable vehicle to drive. Would the Tourys maintain that trend? I started the 3-litre engine and headed out onto a typical Cumbrian A road. Single carriageway, plenty of ascents and descents and lots of bends. I like this particular engine, I find it to have a nice power spread and for that power to be delivered instantly and above all quietly. I am also a fan of the Hi-Matic fully-automatic transmission. I find that the spread of the eight gears ensures smooth steady progression with almost imperceptible range changes. I also like the ease with which you can switch from ECO to POWER mode while on the move. I generally drive in ECO mode but it is reassuring to call on a bit more power if you meet a sharp rise or need to overtake. I was impressed with the way the vehicle sat on the road with no hint of wander, vibration or unexpected movement. It promoted a feeling of total security and the light yet positive steering resulted in the vehicle going precisely where you wanted it to go. Vision through the big one piece screen was excellent and the wipers kept a large, clear vision area. The A pillars are also relatively small and do not create blindspots. The Tourys soon started eating up the miles without effort and I was impressed with the build quality. There was no hint of rattle, shimmer or squeaks from the trim and fittings. I’m not a big user of foundation brakes preferring to control speed using the accelerator and transmission but it was reassuring that when I did deliberately call for a rapid stop using the foundation brakes that the vehicle came to a stop quickly and without any deviation. I found the ambience of the cab, thanks to the driver’s air conditioning, to be comfortable at all times. Vacating the seat I went back into the saloon to try the Tourys from a passenger point of view. I found the seats to be comfortable with a nice degree of support. Vision through the large windows was excellent despite the rain and the ride thanks to the rear air suspension was smooth and without any hint of body roll. The ambience, thanks to the combination of convection heating and air conditioning, meant that a nice balance between warmth at lower levels and freshness higher up was maintained. I was impressed with the overall quietness of the vehicle pointing to the extensive use of insulation; certainly a very pleasurable vehicle to ride in. 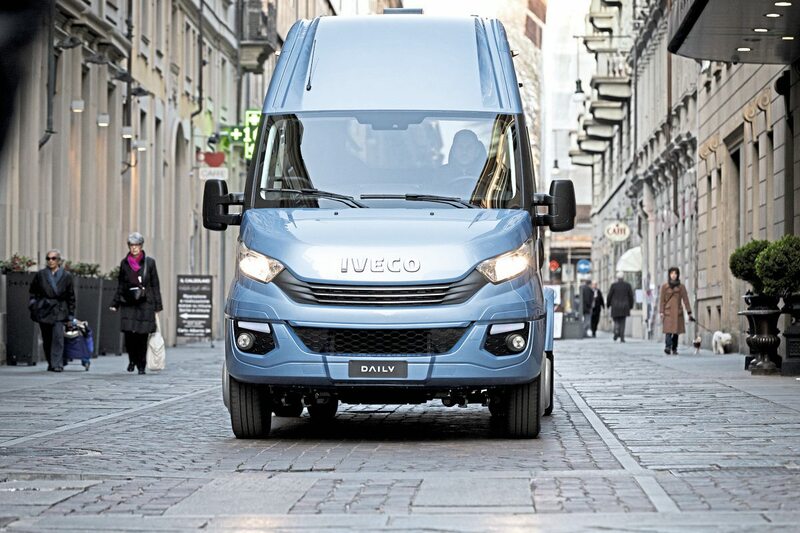 The Iveco New Daily is one of the few vehicles in this category that can offer alternative propulsion systems. As an alternative to the diesel you can specify CNG propulsion or full electric. The CNG version uses the same 3-litre engine simply substituting the CNG for the diesel. In this form it develops slightly lower power at 136bhp and a maximum torque of 350Nm. The electric version has an 80Kw electric motor and a maximum torque figure of 300Nm. 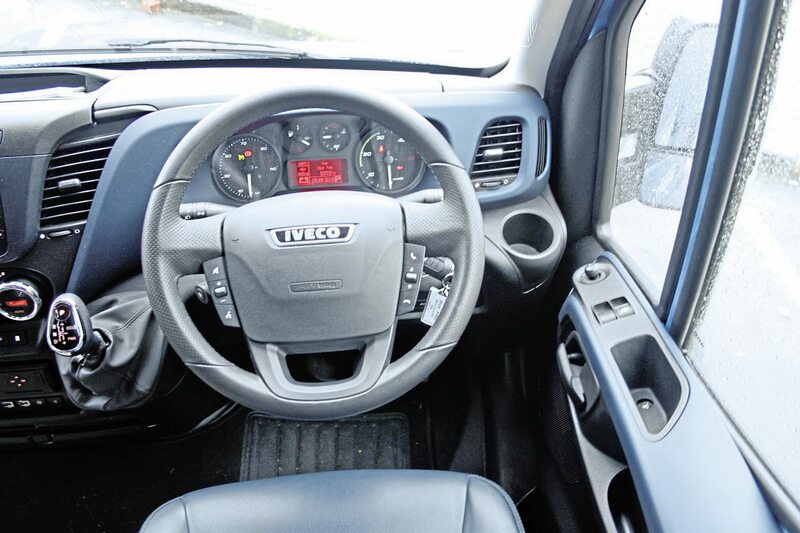 Iveco claim that the vehicle has a typical range of between 120 and 150 miles depending how it is driven. The system will re-charge overnight. I have not yet had the opportunity to try either of these versions so cannot comment on their suitability for minicoach work. Returning to the driver’s seat I prepared to take the Tourys onto the M6 and see how it cruised. The answer was just the same as on the normal road. It quickly rose to cruising speed up against the limiter and as it had done on the A road sat on the road securely and with no deviation. The vehicle is impressively quiet even at full speed. All too soon it was time to give the vehicle back to my Iveco Bus colleagues but it was not without some regrets because I had found the vehicle a real pleasure to drive. Iveco Bus also produce a simpler range of factory-built minibuses called the Iveco Daily Line. A range of sizes and seating layouts are available with up to 22 seats. There are also wheelchair accessible versions which use a rear-mounted, underfloor cassette-type tail lift and some easily removed seats. The Tourys is sold through the Iveco Bus dealer network details of which can be found by going on the website www.ivecobus.com or find out more about the Tourys by calling 0800 915 0040. The Iveco Tourys is a nice minicoach. It is well specified and it is well built. It also performs impressively. 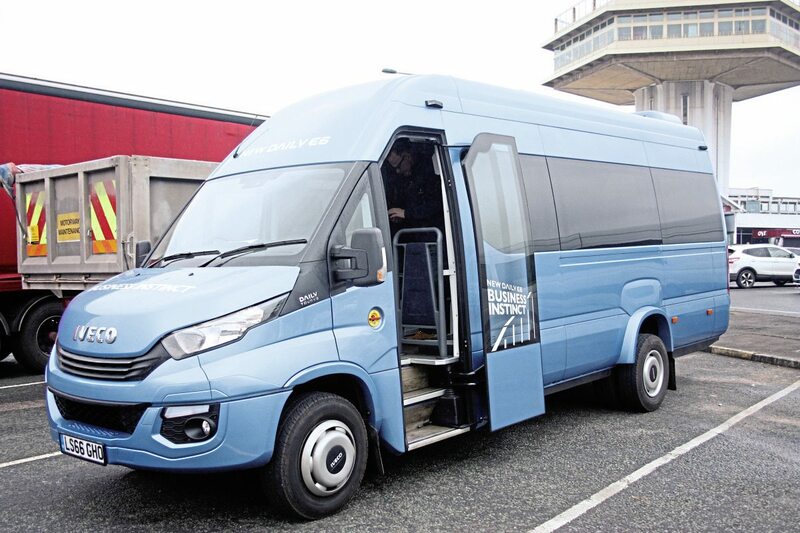 Certainly a worthy addition to the UK minicoach market.